I love the chewy and nutty taste of oatmeal. My mom made it a lot when I was a kid, using the stuff in the round container from the grocery store. When I was older and moved to Vermont for school, I discovered “real oatmeal” of two types— the first was steel cut oats, made from the whole kernel (which looks a bit like pelletized rabbit food), and the other type, thick rolled oats. Rolled oats are made from steel cut oats, but are quickly steamed and rolled, then kiln toasted and dried. I think that’s where the magic happens. Here’s why. If you cook rolled oats ahead of time (like on the weekend), you can portion it out, refrigerate it, and then heat it up in the microwave in the same time that the instant oatmeal packet takes to heat. You’ll end up with a much better result: creamy, nutty, chewy, full-of-fiber oatmeal, to get your day started off right. Momma would be so proud. The master recipe uses a 2 to 1 ratio of water to oats (same ratio for rice. Interesting, no?). A serving of cooked oatmeal is about a cup in size, and that takes about a half cup of raw oats. So, if you want to make a week’s worth of breakfast oatmeal, you will need 5 cups of water and 2 1/2 cups of rolled oats. Boil the water. You can use salt, but I don’t. I like good quality oats just the way they are. 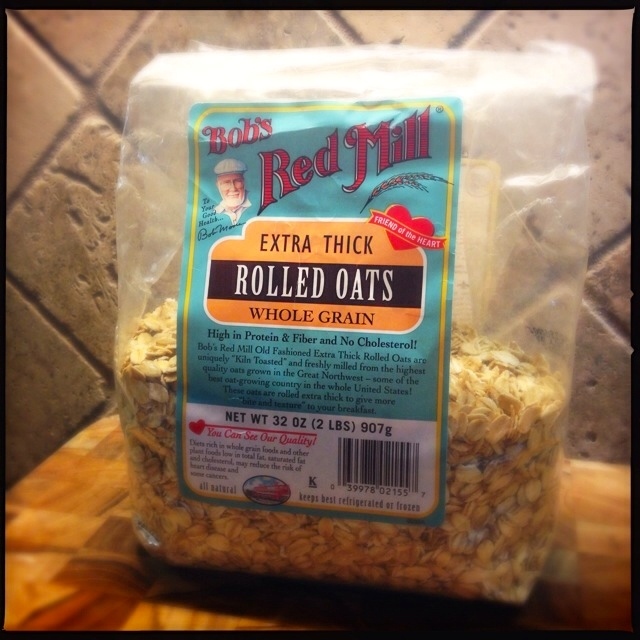 I use Bob’s Red Mill (and I totally want a red vest like Bob’s). Once the water is boiling, add in the oats and give the pot a good stir. That helps prevent the oats from sticking to the bottom of the pot. Turn the heat to medium, and stir the oats every few minutes. 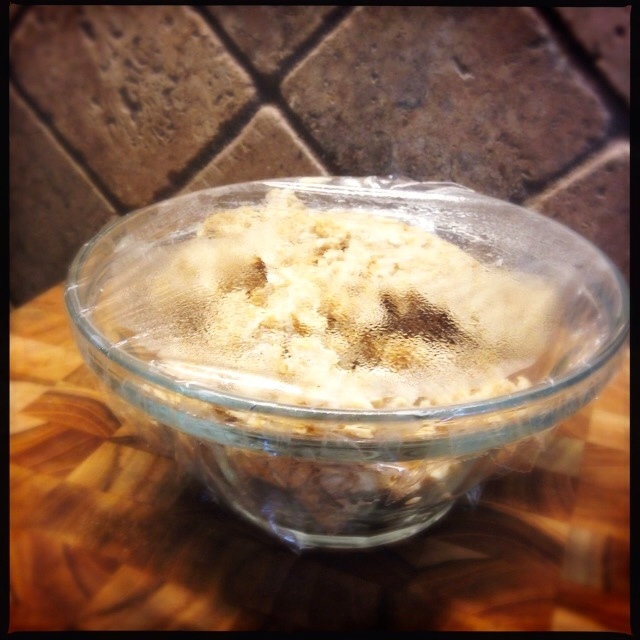 This takes about 10-20 minutes for rolled oats. To determine if the rolled oats have cooked enough, spoon one or two oats out and chew on them. Are they still hard? Cook them a few minutes more. They are nice and chewy? They are done. Once the oats are done, turn the heat off and cover the pot. Let them sit for a few minutes to steam in the moisture. Then serve them with raw honey, your favorite sliced fruit, and some milk or cream if you like. (Just a touch, right?) Suggested toppings and modifications are listed below. If you are squeamish about 5-day oatmeal, make it in smaller batches, or just make it the night before. Once you get the hang of this, you can easily make this while doing other kitchen jobs. When you heat it up, add a splash of water to the oats. They will be thirsty, and need it to heat up correctly. Microwave them for about 1 to 1 1/2 minutes and stir gently to make sure they are heated through. If they are sticky and not creamy, you can add a splash of water or milk or cream (and remember to add a bit more water before you microwave them tomorrow). Top them as you like. If you like Chia seeds (they are terrific in this), you should add them to the water with the oats. They need that cook time to soften. Chia seeds tend to gel up a bit, so you may need to add a tablespoon more of water. 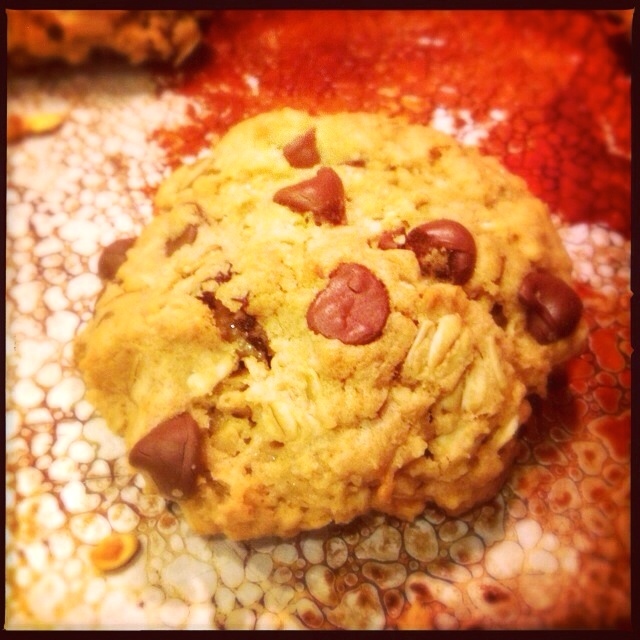 Rolled oats also make killer oatmeal cranberry cookies. With chocolate chips. And nuts. Of course. 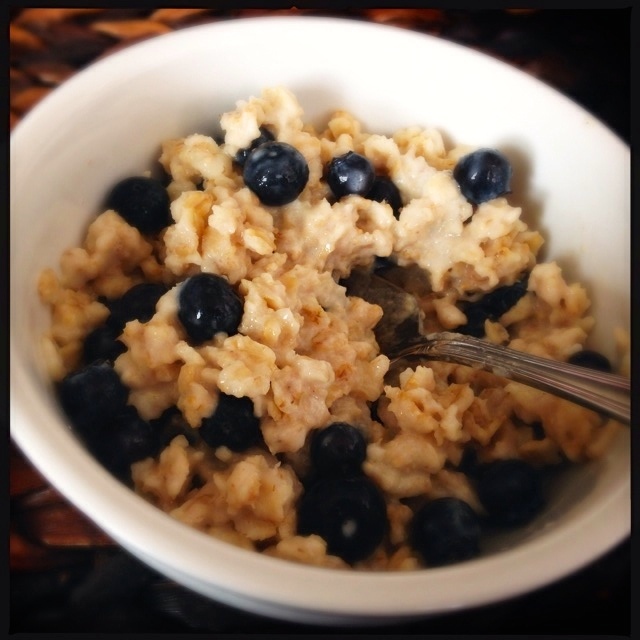 Easy and delicious, this oatmeal recipe can be modified from standard to exciting. Modifications are below. Boil the water. You can add a dash of salt, but I don’t. Once the water is boiling, add in the oats and give the pot a good stir. That helps prevent the oats from sticking to the bottom of the pot. Turn the heat to medium, and stir the oats every few minutes. It takes about 10-20 minutes to fully cook the rolled oats. To determine if the rolled oats have cooked enough, spoon one or two oats out and chew on them. Are they still hard? Cook them a few minutes more. They are nice and chewy? They are done. Once the oats are done, turn the heat off and cover the pot. Let them sit for a few minutes to steam in the moisture. Suggested toppings and modifications are listed down below. Storage. To portion and save the oats, you have options. If you are just making enough for today and tomorrow, I let it cool first, then go ahead and put tomorrow’s portion into a microwave safe bowl, cover it with plastic wrap, and put it right into the fridge. If you are making a whole week’s worth, then you may want to put the leftovers into one large container and just scoop out of it each day. If you are squeamish about 5-day oatmeal, make it in smaller batches, or just make it the night before. Once you get the hang of this, you can easily do it while doing other kitchen jobs. Reheating. When you heat it up, add a splash of water to the oats. They will be thirsty, and need it to heat up correctly. Microwave them for about 1 to 1½ minutes and stir gently to make sure they are heated through. If they are sticky and not creamy, you can add a splash of water or milk or cream (and remember to add a bit more water before you microwave them tomorrow). Top them as you like. What about Chia Seeds? If you like Chia seeds (they are terrific in this), you should add them to the water with the oats. They need that cook time to soften. Chia seeds tend to gel up a bit, so you may need to add a tablespoon more of water.